Here's the bread I've been promising for a while - it's adapted from a recipe in the book "Enklare Bröd" that I reviewed here. (I used more yeast than the original since my kitchen was a bit cold, and my yeast had passed it's expiry date.) It's simple, in the sense that you don't need any machines to make it, and it'll give you great results. You do need time however, and you do need to be at home to take care of the bread - you can't just leave it. Although you can put the dough in the fridge for a few hours between the foldings if you need to go somewhere - I did that after the third fold and it turned out just fine. Folding the dough is what helps it develop gluten, and that in turn creates the nice, hole-y texture that's so desirable. Writing the instructions is however pretty hard, so I hope you'll understand this - if not, feel free to ask! Start by mixing water and yeast. Add flour and salt, and stir into a dough. Leave to rest for 30 minutes. Fold the dough: Wet your hand, and grab one side of the dough. Fold it towards the middle. Do the same all around the dough, 3-4 times. You'll feel the tension in the dough. Leave to rest for 30 minutes, and repeat twice - in total, fold the dough three times. Keep the dough covered with a towel, to prevent the surface doesn't dry out. After the third folding, leave the dough to rise for one hour. After that, move it to a well-floured surface. Stretch the dough a little, so it forms an oval. Grab the top third and fold it towards the middle, and press down. Do the same with the bottom third of the dough. You'll now have a loaf-shape with a seam on top. Turn the dough seam-side down, still on your floured surface, and cover with a towel. Leave to rise for one hour. Place the well-risen loaf on a baking paper (parchment, or teflon), seam-side up. Score the bread if you'd like, before swooshing it into the hot oven. (I used a cutting board to help transferring it - the parchment paper makes it easy.) Bake for a total of 35 minutes, but you can open the oven door to let out some steam every 10 minutes. 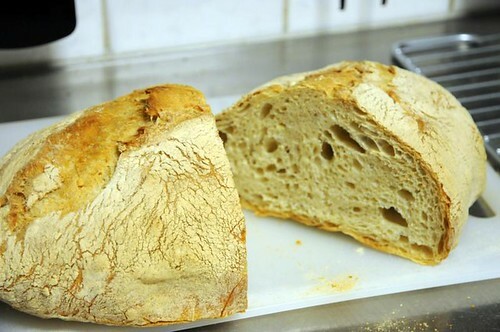 I lowered the heat to about 200-225°C, since I don't like a too-hard crust, but for crustier bread, keep the heat high. Also bear in mind that I have a convection oven, and yours might work differently. Always keep an eye on your bread. You can use a thermometer to check when you think the bread is finished - it should keep an inner temperature of at least 96°C. congrats on NOT using a bread-making machine. I've just discovered your blog and skimmed through your wishlist and noticed the honey-roasted cashews. Have you thought of preparing them yourself? If only for the smell you will create throughout the house and you must try! Roast them in the oven for 7 minutes and sprinkle with a little salt or skip the sprinkling if savory-sweet doesn't appeal to you and then drip honey onto the nuts and bake for 1-2 minutes more.